I recently heard the old John Denver hit song Country Roads on the radio. They were talking about how the writers of the song were travelling when they wrote it, but not to West Virginia, and in fact, they had never been to West Virginia! When I saw the theme for today’s Global Design Project challenge, I thought of this song, and wanted to create a card to reflect that. I did a lot of sponging with both sponges and daubers for this card. 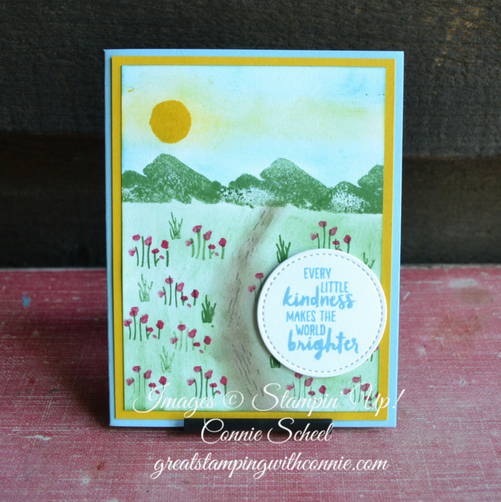 I also used four stamp sets – the little lines stamp from Artisan Textures on my dirt road, the grass tuft from High Tide, the flowers and stems from Sheltering Tree, and the hills, sun, and greeting are from Waterfront. It is wonderful to have a large collection of stamp sets, I can always find the right image for anything I want to create! If you add to your collection a little bit at a time on a regular basis, it is easy to have a wonderful, wide variety of stamps, ink, paper and lovely embellishments to create any type of beautiful project you like.